If you have ever had the chance to visit us here at the world’s freshwater laboratory, and have heard us talk about all of our different lakes while throwing around a bunch of numbers, you have probably been left a little puzzled. Why are some lakes numbered (such as Lake 239) and others named (such as Winnange Lake)? Well, good questions. Let’s take a little walk down memory lane to learn why IISD-ELA’s lakes are named as they are. Back in the late 1960s, when the Fisheries Research Board of Canada (FRBC) was scouring Manitoba and northwestern Ontario for lakes in which they could study the eutrophication problems that were plaguing North America at the time, they had three main selection criteria. They sought lakes that: (1) were relatively unaffected by human actions; (2) were “headwater lakes,” to reduce the upstream effects of the whole-lake manipulations that we often conduct here at IISD-ELA; and (3) were within a four-hour drive of the Freshwater Institute’s laboratory in Winnipeg, to ensure a relatively short transit time to avoid spoilage. During the search, thousands of lakes were identified and surveyed. Naming thousands of lakes for the purposes of surveying is simply not an option—numbering them is a much more practical solution. This initial survey was conducted by dropping in by helicopter, taking a water sample and a maximum depth reading, and measuring the Secchi depth. In total, 1,004 lakes were numbered and lakes 1 to 463 were sampled during the fall of 1967. 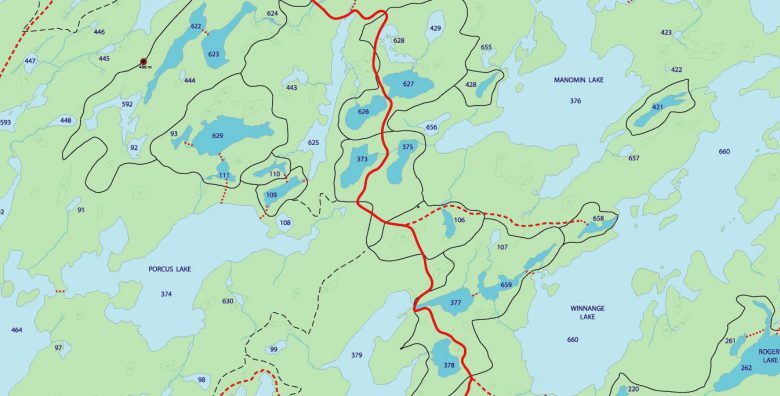 Upon gazing hopefully at a map of the IISD-ELA lakes in an attempt to locate a specific lake, it may seem as though there is no rhyme or reason to the spatial assignment of lake numbers. You will notice that some groups of lakes appear in clumps on the map (such as lakes 219 to 228), whereas in other spots, you will find lakes beside each other with very different numbers (e.g., 240 flows into neighbouring 979). After reading this blog, you should know exactly how to pronounce Lake 626—just like a pro. Although there is no definitive answer on why this is, the most likely explanation is that the surveying researchers just went wherever they felt each day, so they likely labelled lakes 219 to 228 in one day, and the next day they went somewhere else with the chopper and continued numbering consecutively. This would explain the overall seemingly haphazard, but fleetingly sequential, allocation of lake numbers. Whatever the reasons for it, take it from me—it can be pretty confusing for someone new starting at IISD-ELA. I tend to associate places with names and can find numbers challenging to remember. I am originally from Scotland where everything, including houses, hills, streams, farms—even fields—all have names, not numbers! #1. Never pronounce a lake as a three-digit number; the first digit is always pronounced as a single digit. For example, Lake 239 is pronounced “two-thirty-nine” not “two-hundred-and-thirty-nine”. That’s the easy bit. Now you need to decide how to pronounce the last two digits of the lake. #2. If any two digits of a lake repeat then all three digits of the lake number are pronounced as single digits, For example, Lake 226 is pronounced. “two-two-six.” Even so, we were never planning on making it that easy for you. 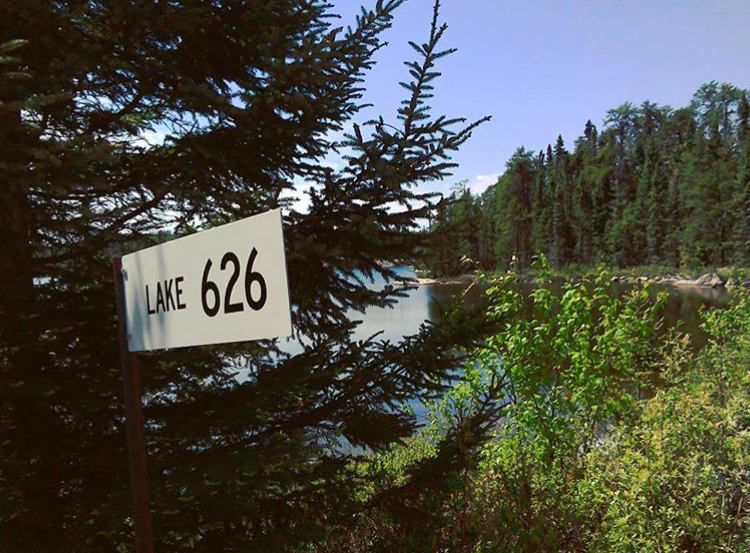 Lake 660 is pronounced “six-sixty” rather than “six-six-zero”—however, this probably won’t be an issue because we mostly refer to this lake as Winnange Lake. #3. Speaking of which, when it comes to our larger lakes, we tend to use the name of the lake rather than the number. Larger lakes in the area include Winnange (660), Teggau (228), Roddy (468), Dryberry (466) and Highwind (464). #4. If the second digit in a lake number is a 0 (zero), we pronounce it as the letter “o” as opposed to the number “zero.” and the last digit is pronounced as a single digit. #5. If the last digit of the lake number is zero, then pronounce the last two digits together as a cardinal number. This applies to Lake 240 “Two-forty” and Lake 260 “Two-sixty”. Some of the lakes at IISD Experimental Lakes Area have both numbers and names—just to confuse you even further.